Columbia Glacier, located in the Chugach Mountains of Alaska, is losing mass faster than almost any other glacier in the state. Columbia is a tidewater glacier, a type of valley glacier that flows into the ocean. Columbia Glacier began rapidly losing ice during the early 1980s. Since that time, the glacier has retreated more than 10.5 miles and lost 50 percent of its volume, mostly due to calving. As of 2015, the ice lost is estimated to be equivalent to 28 to 36 cubic miles of water. In 1996, the council began to analyze the calving and movement of icebergs through Columbia Bay and into Prince William Sound. Tankers carrying oil through the Sound, such as the Exxon Valdez, sometimes leave the established tanker shipping lanes to avoid this ice when it drifts into the lanes. In 2012, the council began to update information developed in the 1996 project to determine the future risk of Columbia Glacier icebergs to the tanker traffic. Funded by the council, researchers W. Tad Pfeffer and Shad O’Neel studied several aspects of ice loss at Columbia Glacier. Researchers predict the retreat of the Columbia Glacier will cease by 2029 – 2036. The maximum calving rate during the remainder of the retreat is estimated to range from 5.8 to 6.2 cubic kilometers (3.6-3.8 cubic miles) per year. More episodes of increased calving are expected, with one episode imminent. A number of factors have reduced the size of icebergs, increased the residence time of ice in the fjord, and increased water temperatures, leading the researchers to the conclusion that individual iceberg size is estimated to be smaller in the future, than at present (2012‐2015). These factors will further degrade the icebergs significantly in the future, meaning that the total ice arriving at the shoal, as well as the size of individual icebergs, will be yet smaller than the total ice and size of icebergs predicted for the glacier’s terminus. A study of the sea floor at the moraine shoal indicates that the shoal has not eroded over the course of the retreat. The likelihood that the shoal will be eroded in the future is extremely low. Erosion would occur from iceberg keels dragging across the top of the shoal. However, the size and number of icebergs present at the moraine shoal was vastly larger in the past than it is today (and is predicted to be in the future) and no erosion has yet occurred. The researchers are confident that the shoal will continue to block the passage of large icebergs out of the fjord and into Columbia Bay in the future. The factors above reduce the size of icebergs arriving at the Heather Island moraine shoal. This also means that a larger fraction of icebergs may have sufficiently shallow drafts to be able to escape over the moraine. 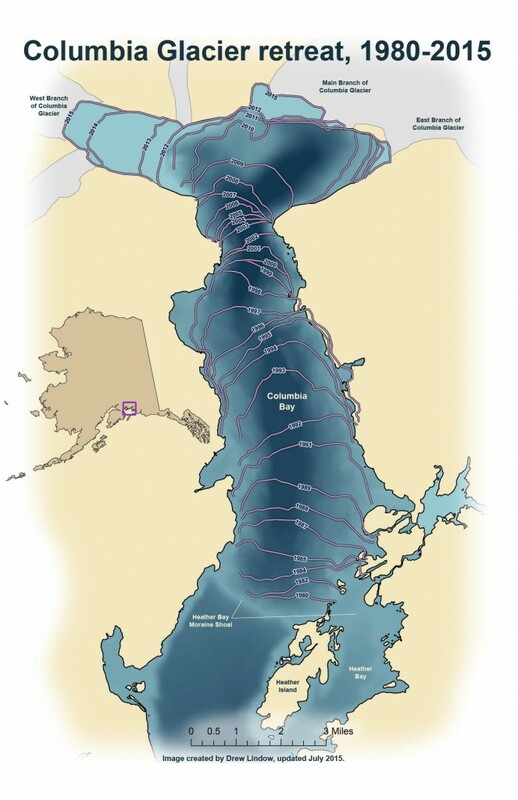 Whether the smaller but more numerous icebergs will increase or decrease the risk to the safe transportation of oil through Prince William Sound depends in part on what size classes of icebergs are viewed as posing the greatest hazard to ship traffic moving in and out of Port Valdez. Report No. 1 – Researchers summarized what is known about Columbia Glacier’s retreat since the completion of the original 1996 project. Report No. 2 – Researchers summarized the current rate of iceberg calving and drift trajectories. The researchers recovered and inventoried historic records, collected bathymetric (geography of the sea floor) data, and updated glacier retreat projections. During this phase of the project, researchers installed a camera on Heather Island and attempted to create a model that would help predict the movement of the icebergs around Columbia Bay. The model could not be created due to the increasing complexity of ocean circulation in the fjord. Report No. 3 – Researchers provided progress updates, including information from time lapse cameras and a variety of remote sensors. The report also evaluated the current status of the retreat and refined their previous estimate of future retreat, calving, down-fjord ice movement, and passage of ice over the Heather Bay Moraine Shoal. Report No. 4 – Researchers evaluated whether ice in the east branch of the glacier could be evacuated rapidly and discussed changes to the previous estimates. Report No. 5 – Researchers evaluated the dynamics of the glacier’s terminus (end of the glacier where ice calves into the ocean) and updated estimates established in report No. 3. This report also summarized additional field operation conducted to support the project. Final Report – Summary of project findings: Icebergs discharged by the glacier during the retreat have largely been contained within the moraine shoal, located at the position of the terminus prior to the glacier’s retreat. The fraction of icebergs crossing the moraine and entering Prince William Sound proper still pose a potential hazard to ship traffic in the Sound.